Recently, the operators of a bookstore in Southampton, England made an unusual appeal to people in the community. They sought help moving books and other things to the store's new location, a short distance down the street. Community-based October Books put up announcements around the neighborhood and on the internet. They asked, "Can you lend a hand?" The bookstore made clear the work would be volunteer and that all kinds of people were needed. It would be a lot of work, even if the store was relocating only about 150 meters down the street. Part of the work required serious lifting and boxing things. "This is not a family event, we need people happy to do heavy lifting," said an announcement posted last Sunday on Facebook. Naturally, the store had to move books – lots and lots of books. The announcement said the move would be happening throughout the week. But community members did not wait long to start coming forward to offer their help. A report in the Southern Daily Echo newspaper said at least 250 volunteers showed up last Sunday ready to work. With that number of people, the organizers decided to change their method for moving books from the old store to the new one. Instead of having people carry them, volunteers formed a human chain to pass the books from person to person. They lined up between the two locations along Portswood Road. Clare Diaper works at October Books. She told the Southern Daily Echo she was caught by surprise at the huge amount of interest. "It was just amazing, we started with 10 people having to run between shops and ended up with 250 people passing books," Diaper said. She added that she got "quite emotional" and found the level of community support "heartening." Jani Franck was part of the human chain. She also told the newspaper it was "amazing" to see the power of so many local people in action. "October Books have done really well. I'm in awe," she said. Local news reports said the volunteers passed about 2,000 books from hand-to-hand on October 28 alone. About 18,000 more were to be moved the rest of the week. The Grand Opening of the new store is set for Saturday, November 3. 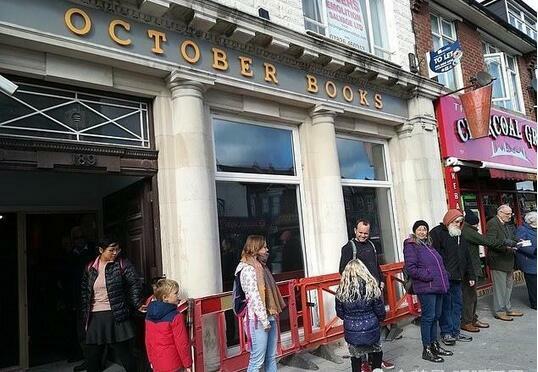 October Books decided to move from its old location because of rising costs. The operators said they did not have enough money to pay for continued use of the building. So they launched a campaign to raise money to buy a nearby old bank building as the store's new home. The Guardian newspaper reports that October Books was founded in 1977 as a small "radical bookshop cooperative" named after Russia's October Revolution. But the business kept expanding as it grew over the years. Why don't you play football instead of just looking on? I have had to pay for repairs to the house. Every year we have charity days to raise money for unfortunate people. 5.They asked, "Can you lend a hand?" I was hoping you'd lend a hand. They gave up their holiday to lend a hand in the work. 6.But community members did not wait long to start coming forward to offer their help. In2009 I want to see more women coming forward.